Successful enterprise are all about business agility and able to introduce new products and services in the market. All this business agility coupled with reduced IT overheads means, the enterprise need to find better ways to improve and transform their enterprise systems. Partition by Function – Divide the functionality by usage patterns or resource consumption. The functionality can be exposed using RESTful or Web services. This functional grouping will help in achieving optimization at the resource level. This helps to scale individual functional groups based on their resource characteristics (High CPU, More RAM, High I/O). 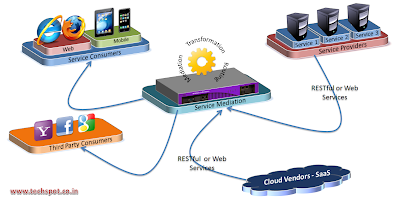 This pattern organizes the enterprise platform around services which in turn provides agility. Things can be done in parallel because the output is a service. This allows fast time to market. Helps create an infrastructure that allows services to be built very fast. Public/private cloud integration – Enterprises need to have standardized integration strategy as the need on board multiple applications from multiple vendors start becoming common. Enterprise need to start integrating with SaaS vendors that can provide the required apps for the consumption of the enterprise users. At times, the integration might need to be handled at the API levels specifically for authentication/authorization. Enterprise applications specially that are consumer facing can also be hosted in public clouds. Enterprise need to integrate services that handle data coming in or going out from public cloud / SaaS vendors to their data centers.